We Know We Love Them But Why Are Chicken Wings So Popular At Super Bowl Time? Chicken wings are a powerful food — they lead people to crime and cause us to worry about their price going up. But why are they so important during Super Bowl parties? Is Taco Bell right, are vegetables the losers and fried foods the necessary snack material for the big game? Though we’ve come to accept their presence every February, the popularity of chicken wings all leads back to the humble sports bar. In the days and leading up to the Super Bowl, Americans head out en masse and buy millions and millions of chicken wings, notes NPR’s The Salt blog. And that seasonal boost will keep growing, according to the National Chicken Council’s chief economist. “That bump has gotten bigger and bigger” over the years, he says. The popular pairing of meaty athletes with meaty snacks started back when sports bars were becoming de rigueur decades ago, he adds. 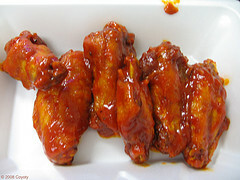 Watching sports for a long time means a demand for cheap snacks, and wings are both convenient and not pricy. “Ribs and pizza were the competition,” he notes, both of which just aren’t perfect for extended periods of time at a bar. Anyone who’s seen the sheen on a less-than-fresh pizza can relate. The National Chicken Council has taken on a more active role now that it’s realized just how popular chicken wings are, including its pre-game Wing Report. This year’s report says Americans will chow down on 1.23 billion wings next weekend, an amount that would “stretch from Candlestick Park in San Francisco to M&T Bank Stadium in Baltimore 27 times” if laid end-to-end. That’s a lot of wings. Delicious, delicious wings.